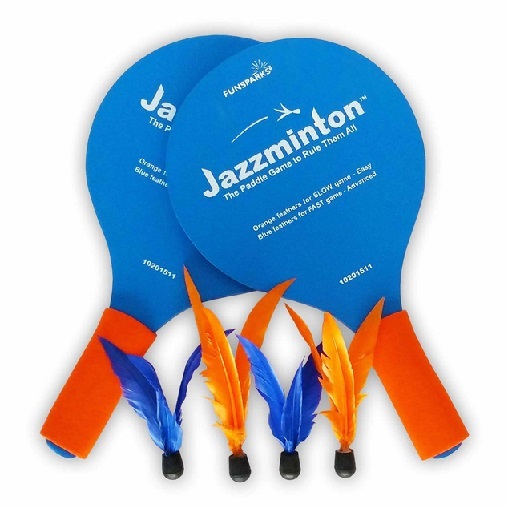 Jazzminton is a fast-paced, action packed paddle game combining the best of ping pong and badminton - without the nets or table! This adaptable game can be played indoors or outside. The goose feather birdies are specifically engineered to spin in the air, making it easy to hit them back and forth at high speeds. All game components float if you choose to play in water, and the lightweight birdies allow you to play indoors without the worry of breaking anything. Soft comfortable foam handles on light paddles make this a great game for multiple ages. Can even be played solo as an excellent test of eye-hand coordination. One set includes 2 paddles, 2 fast flying birdies, and 2 slow birdies. Extra birdies available, including LED version.